Selected as a Top 100 Global Thinker by Foreign Policy magazine, Jamais Cascio explores the intersection of environmental dilemmas, emerging technologies, and cultural evolution, specializing in plausible scenarios of the future. 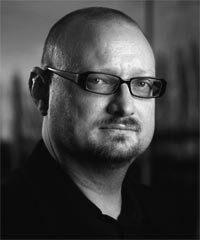 Cascio is presently a Distinguished Fellow at the Institute for the Future in Palo Alto and serves as Senior Fellow at the Institute for Ethics and Emerging Technologies. In 2009, he published Hacking the Earth: Understanding the Consequences of Geoengineering. His work has appeared in the Atlantic Monthly, Foreign Policy, and the New York Times, among others publications. Cascio has been featured in a variety of television programs on future issues, including National Geographic’s 2008 documentary on global warming, Six Degrees, and the 2010 CBC (Canadian Broadcasting Corporation) documentary, Surviving the Future.